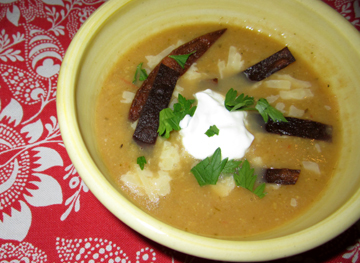 This entry was posted on Friday, August 31st, 2012 at 4:00 am	and is filed under Soups and Stews, Vegetables. You can follow any responses to this entry through the RSS 2.0 feed. You can leave a response, or trackback from your own site. Thanks! I’m making this today!!! On chilled tomato soup: It’s a beautiful thing to have a cold vegetable soup on a warm summer day. 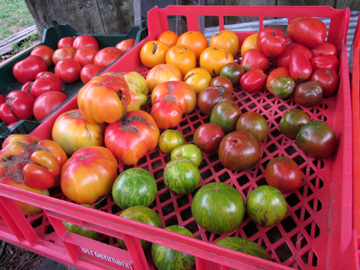 Lancaster suggests starting with regular garden-variety tomatoes. Roast them briefly in the oven with some tomato paste, paprika, shallots and garlic, to concentrate their flavors. And then toss them into a food processor with some olive oil. “You end up with this luxurious, silky, rich tomato soup, and it’s beautiful — lovely with a nice bread,” she says. That one sounds lovely too, Gold! And Kelly, you’re welcome; I have already made it again myself.